After the new Catalan separatist bloc warned it would declare independence if it wins the 27 September regional elections, Spanish premier Mariano Rajoy said he’ll do everything he can to stop it. EURACTIV Spain reports. A new crisis was opened on Monday (20 July), when Catalan separatists joined forices to form a new colation called “Junts pel Sí” (Together for “Yes”). The bloc was formed by the Democratic Convergence of Catalonia (CDC, the party of regional Prime Minister Artur Mas, Oriol Junqueras, President of the Catalan Republican Left (ERC), and several civic associations. Even former FC Barcelona coach Pep Guardiola offered to join the cause. Although Mas has spoken of a six to eight month period before declaring independence (if the separatist bloc wins the elections), the members of Junt pel sí agreed to speed-up its drive for independence. “We are completely serious about this, and everyone needs to understand that we are going to do it,” said Raül Romeva, a former Iniciativa Catalunya Verds member of the European Parliament. “In the event that the Spanish state, through political and or legal decisions, should block Catalonia´s self-government, the (Catalan) government and parliament will proceed to proclaim independence and approve the judiciary transitional law,” he told Spanish media. In an informal poll on 9 November, a majority of Catalans supported independence. With 7.5 million inhabitants, it is one of the richest regions in Spain. However, experts questioned the legality of such a vote. A bid to organize a legally binding referendum in the Catalan autonomous region last year was blocked by Madrid, as being unconstitutional. “We have tried every other way, but they didn’t let us. This is the chance to do what we couldn’t do on 9 November, and obtain a democratic mandate,” Romeva added. On 27 September, Catalans will vote in parliamentary elections. The separatist bloc is framing the poll as a referendum on independence. Pedro Sánchez, the leader of the Socialist Party (PSOE), concurs with Rajoy on Catalonia. 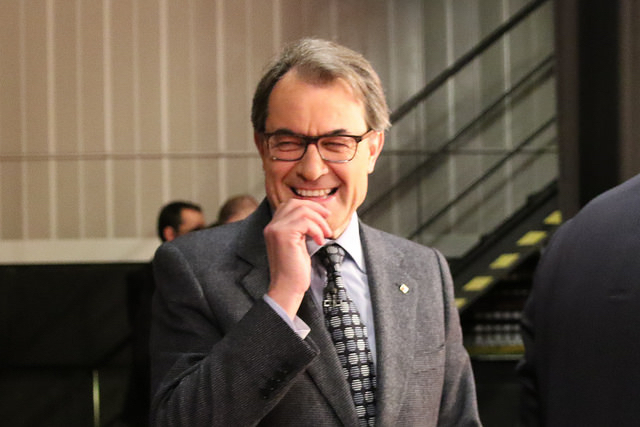 Artur Mas, Oriol Junqueras and “Junts pel Sí” will “divide and break” Catalan society, Sánchez said. The PSOE “will never accept any challenge to legality”. Experts on constitutional law warned that, if needed, the central government could temporarily “retake control” of Catalonia, as laid down in article 155 of the Spanish constitution. The article allows the government to approve “the necessary measures” to force a regional community to comply with its constitutional obligations. But before taking such an extraordinary measure, the central government must always ask the prime minister of the problematic region to change its attitude. Only in the event of a refusal can this mechanism be activated, according to the constitution. “This can only happen in exceptional cases, when ordinary judicial remedies may not be effective,” Francesc de Carreras, an expert on constitutional law, told El Pais. According to journalist Victoria Prego, the separatist bloc is pressing Madrid in order to obtain much more – and extended – competences, most of which are economic. Ah yes as usual….politicians trying to force violating the Spanish constitution ! In fact some didn’t and other liked Francisco Franco who fought for the Integrity of Spain ! At least Franco today would tackle again against such unconstitutional regional-nationalistic political forces like Artur Mas ! If Cataloñia wants a referendum for its totally independence it would be at least less unconstitutionally to involve the whole Spanish population because it’s Spanish territory and belongs to ALL Spanish people and this of course if Madrid approves it ! During the Scottish referendum you claimed it was only the Scottish people’s right to decide their future as a Nation State & had noting to do with the British as a whole, now in Spain you claim it is for all Spanish people to have a vote not just the Catalan’s, you can’t have it both ways. As ‘an European’ who clearly hates ‘Nationalism’ why are you trying to force your fake European Nationalism onto the peoples of Europe while at the same time denying the Nation statehood of the people of Catalonia and forcing onto them a Spanish Nationalism ? Looks like Catatonia will be the first country to leave the antidemocratic EU. Go for it guys, the world is far larger than the bankrupt European Union. Of course It won’t and it won’t allowed to be the constitution violated that way like Ivan Burrows prefered to instigate ! And if Cataloñia begins with clashes and unrest there will be the Civilian Guard l and in worst case the Spanish Legion to appease them . I am aware that you federalist fanatics hate the idea but Catalonia will be whatever the Catalan people want it to be, it is called democracy. What will you do to stop them, send in the invisible EU army and crush them ? It’s not about the E.U or if Mas wants out of the E.U. or about federalists fanatics but it concerns t the constitutional integrity of Spain only ! Democracy has its definition and there is a limit too ! Your minded democracy is called anarchy where you act as an outlaw breaching a constitution beyond the limits! And you don’t ask even the majority of Spain if they want to cede Catalonia away ! You take all law and constitutionally breach on your opportunity to scapegoat even the E.U. and the rest of Spain as being undemocratic ..find a screw near you! As I stated – read it – the whole Spanish population ! Crush them ? Why ? Catalans and all lawmaker knows if they force to disrupt constitutionally an undemocratically the integrity of Spain then of course as every democratic Country it has to defend its values unless Madrid allows a change in the constitution. But I doubt since the King ceded 300 years ago the peninsula rock away without people’s consent . As they are already an autonomous region with own privileges then Madrid may see no reason to split it apart! Why then! Cataloñia will and remains a Spanish National Treasure . Would you prefer a civil war in Spain ? we are leaving your antidemocratic EU, the only question left unanswered is who will leave first, a free Great Britain, a free France, a free Italy or a free Catalonia ? The people will decide, not a bunch of pro EU federalist fruitcakes. Sorry to offend yourself with your idioties and stupidities but there is a great discrepancy concerning your reasonement ! Cataloñia is a REGION in SPAIN again .. A R E G I O N in S P A I N under the Constitution of Spain ! Scotland is a COUNTRY being highly raped by the undemocrastic Westminster of the British Union WHO nobody voted for ! Ivan Burrows I know that you’re a supporter of the Blackshirts and so ignorant like the “HEIL” Salute of Charlotte ! If you must make statements about Great Britain at least do a little basic research first, it was the Scottish people who asked for the act of Union in 1707 & for a very European reason, they were bankrupt and needed a bailout, The English didn’t want it. Believing the EU propaganda as you do you may have missed it but the Scot’s DID vote and elected to be part of Great Britain, you may hate the result but that is what we like to call democracy in action. Strange that you would call me a fascist given it is you who deny the people of Catatonia their right under Article 1.2 of the Charter of the United Nations, look it up. Given the whole point of your antidemocratic EU is to dismantle ‘Nationalism’ why would you want an Ultra Nationalist independent Nation State of Scotland in your EU anyway ?